Happy Wednesday! 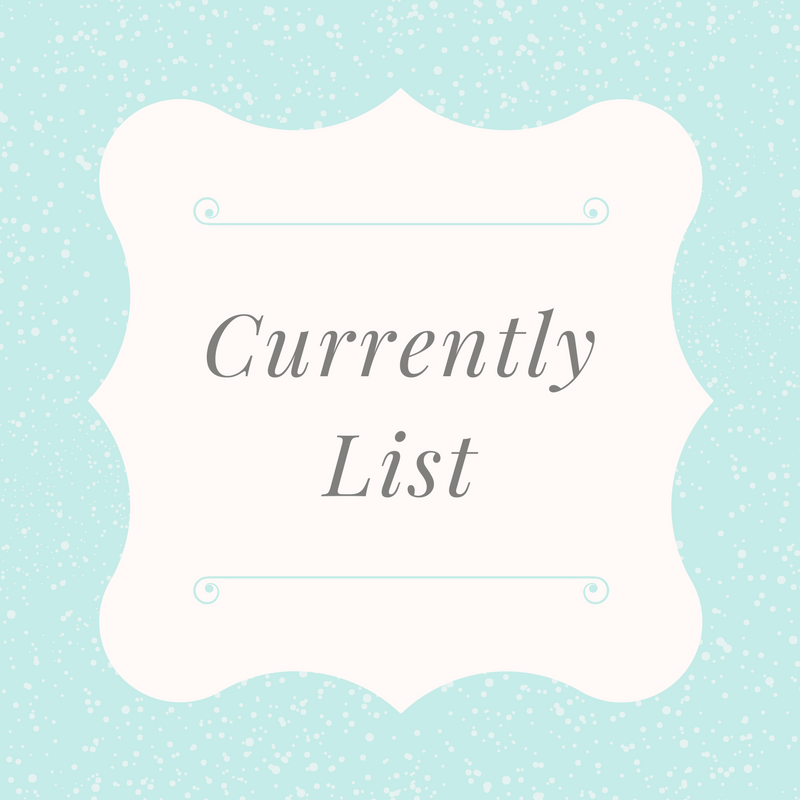 It's time for another Currently List. Watching: I've been a little sick so I spent some time resting and watching Twilight (don't judge me lol). I also have some shows to catch up on like The Gifted and Marvel's Inhumans. 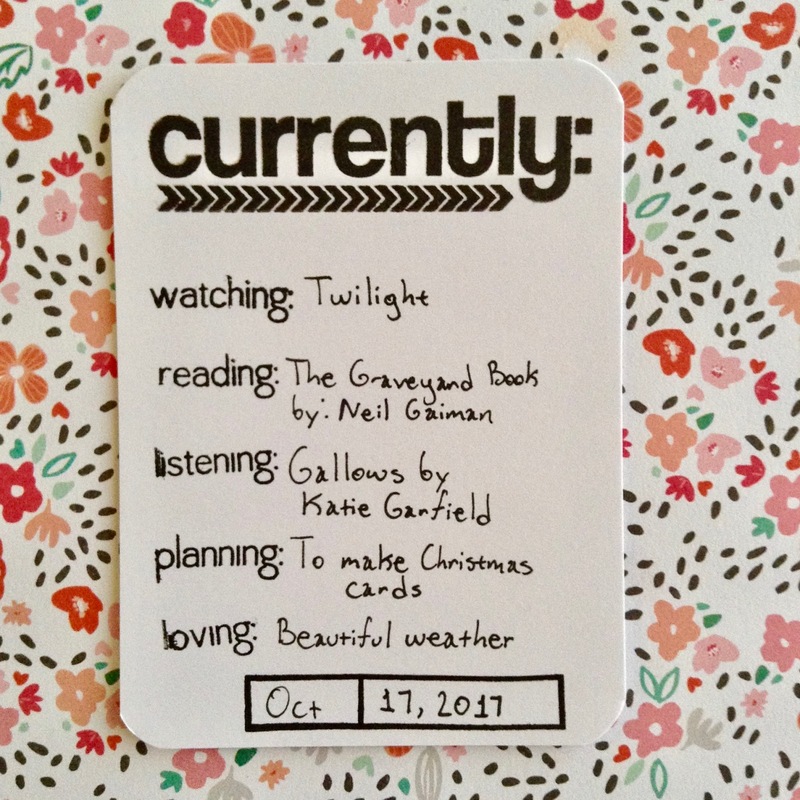 Reading: Since it's October, I had to read The Graveyard Book by Neil Gaiman. It's such a great book. Do you have any books that you like to reread during October? Listening: I still love this song so much. You can check out the song over here. Planning: It may be a bit early, but I'm going to work on some Christmas cards soon. Loving: The weather has been so amazing. It was in the 40s and then it got up to 70 degrees. It was the perfect fall weather. Happy Thursday! Today I am so excited to share my review of What We See in the Stars by Kelsey Oseid. I absolutely loved this book. I have always been fascinated with astronomy and mythology. This book is amazing and the illustrations are gorgeous. I love how the book is organized. The book is broken up into seven sections: The Constellations, The Milky Way, The Moon, The Sun, The Planets, Asteroids, & Meteors, and Deep Space. The book includes some definitions and explanations that is easy to understand. I learned so much from this book and even did some more research on a few things. I really loved reading the stories about Ptolemy and the constellations. This book is perfect for all ages and I would recommend this book to anyone who loves astronomy, mythology, and science. Have you read What We See in the Stars? What are your thoughts? Happy Tuesday! It's time for another Currently List. Watching: I've been catching up on some TV shows. I'm currently watching Lucifer, The Gifted, and The Good Doctor. I'm so glad that Lucifer is back. It's such a great show. I still don't know if I like The Gifted, but I'm going to watch a few more episodes. 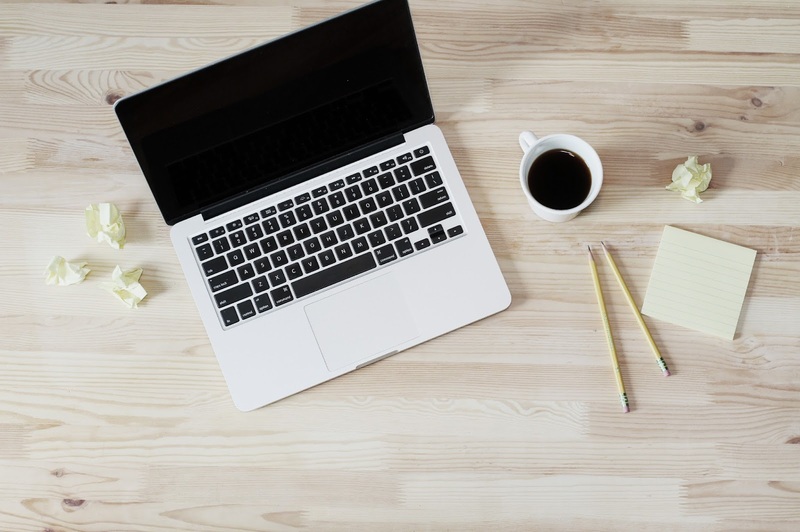 Reading: I've been reading lots of blog posts. I didn't read a lot of blogs over the past few days so I have a lot of catching up to do. Listening: So I found out that Ciara made a cover of Paint It Black by The Rolling Stones. I was actually surprised that I liked her cover. You can check Ciara's cover of the song here. Making: I'm trying to get better at meal planning so I have been making grocery lists and menu plans. I also made a list of recipes that I want to try and added the ingredients that are needed to my grocery list. Feeling: I'm feeling so well rested and a bit energized. It's amazing how getting enough sleep can make such a difference. Planning: I haven't made a lot of cards, layouts, or art. I've been feeling a bit off and uninspired, but I plan on making something in the next few days. Loving: I'm loving this season. Fall is definitely one of my favorite seasons. I love that the leaves are changing and the weather is cool in the morning. Happy Monday! 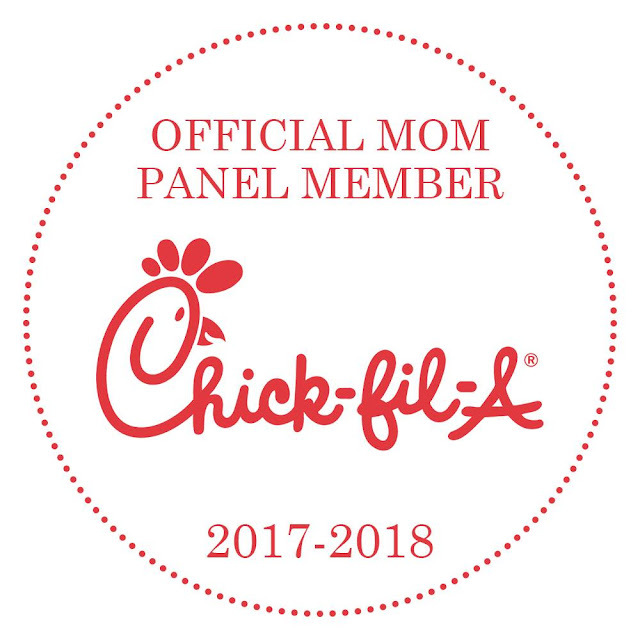 If you follow me on Instagram or read a few posts in the last few weeks, you may have noticed the announcement that I made about being selected to be part of the Chick-fil-A Mom Panel. Since I am on the Mom Panel, this means that I will be able to share lots of cool news and updates with all of you. There may be times when I might receive a little something from Chick-fil-A which I will disclose with you all. I am so excited to be on this panel since my family and I love Chick-fil-A. I can't wait to see where this adventure takes me. Have you been to Chick-fil-A? What's your favorite menu item? Watching: I woke up to the terrible news in Las Vegas. I have been watching the news all day. My thoughts and prayers are with the victims and all of those affected in the shooting. Reading: As usual, I have been catching up on some blog posts. I still have to finish reading a few books too. Listening: I have been listening to a bunch of songs by Britney Spears. Some of my favorite songs are "I Wanna Go", "Hold It Against Me", and "Criminal". I just realized that all three of these songs are from her Femme Fatale album. What's your favorite song by Britney Spears? Making: Since I want to try a few new recipes, I decided to add the ingredients to my grocery list and I am also making a menu plan. I've noticed that if I make a menu plan, I tend to stick to it. Feeling: I'm feeling a bit better after being sick for the past few days. I definitely think that getting some rest helped me recover. Planning: I have to finish planning for October. Time to get my planner and work on scheduling some events and blog posts. Loving: I prefer pancakes over waffles, but lately I have been devouring waffles. Happy Monday! I'm so excited because it's finally October. September was a bit of a busy month so I am hoping that this month will be a bit easier. October is one of my favorite months and I'm so excited for spooky movies, delicious treats, and Halloween! Since it's the beginning of the month, I'm going to share a recap of my goals for September as well as my new goals for October. Try 2 new recipes: This was a fail. I have so many different recipes that I want to try, but couldn't decide on which ones to make. September was a busy and very strange month. I was feeling so exhausted which left me not wanting to make new things. Post 15 blog posts: I did not accomplish this goal. I had 13 blog posts up in September. Read 2 books: Unfortunately, I did not accomplish this goal. Although I did read a few books this month, I didn't finish all of them. I should probably just read one book at a time. I should be done with one of the books by the end of this week. Exercise two days a week: I'm not sure whether to consider this a pass or a fail. Although I was extremely exhausted and I was sick for over a week and a half, I did exercise. Hopefully I can accomplish my goals for October.